“Dwarf” is a broad term that has been used to describe any supernatural being of short stature, often stunted and ugly in form, and living under the earth. Here it is used to refer specifically to the Scandinavian dwarfs, the chthonic master craftsmen who emerged from Ymir’s corpse, the personifications of the earth’s might and riches. They are also known as Dark Elves or Black Elves, distinguishing them from the elves living on the surface. When Odin and his brothers slew the frost giant Ymir, they used his body to make the world. From his blood they made the seas and rivers, from his flesh the land, from his bones the mountains, and from his teeth the stones. The vault of Ymir’s skull was the heavens, and fire from the land of Múspellheim became stars. Living inside the ruin of Ymir’s body were maggots digging through his flesh. Odin gave them consciousness and human form, but, much like maggots, they continued their existence digging through earth and stone. Odin tasked four dwarfs – North, South, East, and West – with holding up Ymir’s enormous skull. Dwarfs were twisted, hunchbacked, bearded, short-legged, pallid like corpses, shunning the sun – which turned them to stone. As there were no female dwarfs, they carved new dwarfs out of the rock. While small and ugly by the Aesir’s standards, they were also unequaled as artisans, smiths, and jewelers. The greatest of the Aesir’s artifacts were made by dwarfs. After Loki cut Sif’s hair as a prank, the other gods forced him under penalty of death to restore her beauty. The trickster god went to the sons of Ívaldi, who not only fashioned perfect golden hair for the goddess, but also the ship Skídbladnir, and Odin’s spear Gungnir. Impressed with their work, Loki dared the dwarfs Brokkr and Sindri to do better, wagering his own head in the process. Despite Loki’s best efforts to stop them, which included turning into a fly and biting them at crucial moments, he was unable to prevent the creation of the golden boar Gullinbursti, the gold ring Draupnir, and Thor’s hammer Mjolnir. All those gifts were presented to the gods, who decided that the hammer was the greatest item made by the dwarfs. Brokkr made for Loki’s head, but was outwitted by the god. “I wagered my head only, and not my neck. You’re welcome to it – if you do so without touching my neck”. Frustrated, Brokkr settled for stitching the impertinent Loki’s lips together. Dwarfs also made Gleipnir, the silken ribbon that was used to bind the Fenris-wolf. It was made from a cat’s footfall, a woman’s beard, a mountain’s sinews, a rock’s roots, a fish’s breath, and a bird’s spittle. The wolf was immediately suspicious of the fragile-looking thread, and the god Tyr had to put his hand in the wolf’s mouth to humor him. As expected, the dwarfs’ cord held fast and bound the Fenris-wolf, but at the cost of Tyr’s hand. The dwarf Alvíss, the “all-knowing”, lusted after Thor’s daughter. The god consented to give him her hand in marriage, but only if he could answer the questions he asked. Thor then proceeded to ask Alvíss questions about the world and the universe, which the wise dwarf answered proudly. In fact, Alvíss was so engrossed in showing off his intelligence that he failed to notice the approach of dawn, and the unfortunate dwarf was turned to stone by the rising sun. Known Eddic dwarf names include Ài, Àlfr, Althjófr, Alvíss, Andvari, Austri, Báfurr, Bifurr, Bömburr, Brokkr, Dáinn, Dólgthvari, Dóri, Draupnir, Dúfr, Durinn, Dvalinn, Eikinskjaldi, Falr, Fidr, Fili, Frosti, Fundinn, Gandálfr, Ginnarr, Glóinn, Hárr, Heptifili, Hledjólfr, Hörr, Hugstari, Ívaldi, Kili, Litr, Mjödvitnir, Módsognir, Náinn, Nár, Nidi, Nípingr, Nordri, Nóri, Nýi, Nýr, Nýrádr, Óinn, Ónarr, Óri, Rádsvidr, Rekkr, Sindri, Skáfidr, Skirfir, Sudri, Svíarr, Thekkr, Thorinn, Thróinn, Thrór, Váli, Vestri, Vídr, Vindálfr, Virfir, Vitr, and Yngvi. Aldington, R. and Ames, D. trans. ; Guirand, F. (1972) New Larousse Encyclopedia of Mythology. Paul Hamlyn, London. Appenzeller, T. and the Editors of Time-Life Books. (1985) Dwarfs. Silver Burdett Company, Morristown. Keightley, T. (1978) The World Guide to Gnomes, Fairies, Elves, and other Little People. Avenel Books, New York. MacCulloch, J. A. (1964) The Mythology of All Races v. II: Eddic. Cooper Square Publishers, New York. Sturluson, S. (1916) The Prose Edda. Humphrey Milford, Oxford University Press, London. 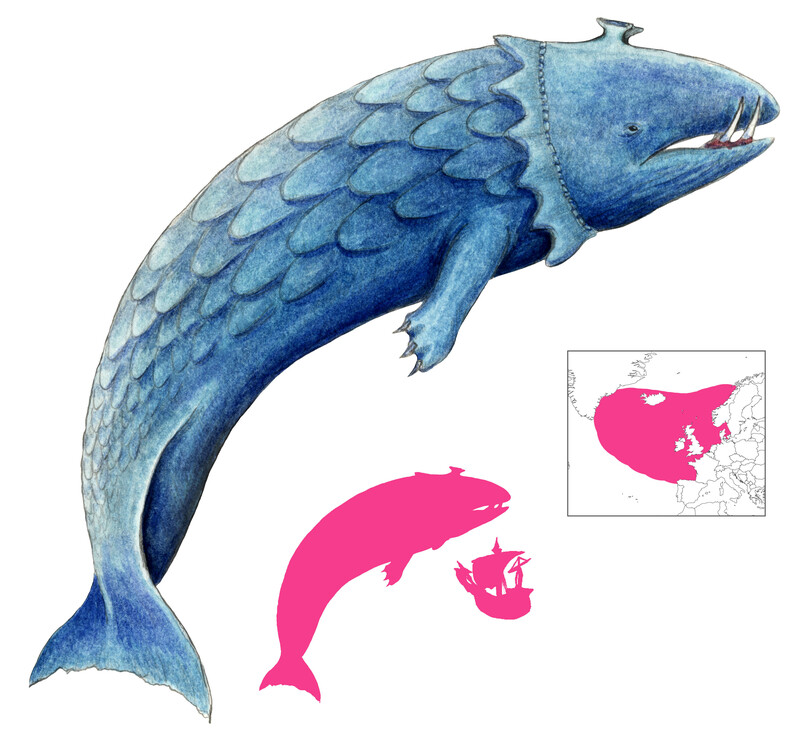 The Trolual or “devil whale” is one of the more familiar sights on ancient ocean maps. These malevolent cetaceans are mostly found in the northern Atlantic around Scandinavia. Troluals are depicted as enormous whales with prominent tusks, frills, paws, and large scales on their body. They are as big as mountains, and may have vegetation growing on their backs. A sleeping trolual on the surface of the ocean looks deceptively like a small island. Sailors will land on it, walk around, even start a fire – and then the whale awakens and sinks below the waves, drowning anyone unfortunate enough to remain on it. Unlike most other island monsters, troluals will also take a more proactive approach by crushing and overturning ships, making them a significant navigational hazard. Fortunately, troluals can be distracted from their murderous intentions. One strategy is the sounding of trumpets, which are loud enough to momentarily startle and confuse the trolual. Barrels thrown overboard will also divert the whale’s attention. As the trolual plays with its new toys, the ship can sail to safety. Even the great troluals are not immune to exploitation by humans. Munster states that the inhabitants of Iceland build their houses out of the bones of these whales. The only major literary appearance of a trolual is in the fabulous tale of Alector, where one surfaces off the coast of the Asian Tangut Empire and ravages harbors every full moon. It is defeated and slain with the help of a magical flying hippopotamus. Aneau, B. (1560) Alector, Histoire Fabuleuse. Pierre Fradin, Lyon. van Duzer, C. (2013) Sea Monsters on Medieval and Renaissance Maps. The British Library, London. Gessner, C. (1560) Nomenclator aquatilium animantium. Christoph Froschoverus. Munster, S. (1552) La Cosmographie Universelle. Henry Pierre. Nigg, J. (2013) Sea Monsters: A Voyage around the World’s Most Beguiling Map. University of Chicago Press. The Ziphius is a huge and horrifying sea monster, reportedly found in northern seas and near the Scandinavian coast. It resembles a whale in shape and size, but with a viciously sharp beak and terrifying bulging eyes. The beak and bristly hair around the head and neck combine to give it an owlish appearance. The ziphius also has a pointed dorsal fin, paw-like flippers, and horizontal stripes down its length. It is a carnivore, feeding on seals and sailors alike. The Ortus Sanitatis gives it four fully-formed legs and tail, making it look more like a beaked lion or even a hedgehog. Olaus Magnus describes its hideous, beaked head, comparing it to an owl (or a toad in the French translation). It has a deep maw, horrid large eyes, and a knife-like dorsal fin used to tear holes in ships. Gessner compared it to the physeterus. Munster showed it swallowing a sea calf, and emphasizes the fact that it is horrible. Today Ziphius refers to the harmless and rarely seen Cuvier’s beaked whale. Killer whales probably were a more significant contribution to the image of the ziphius, as were swordfishes – ziphius is derived from xiphias, or sword. De Montfort interpreted the ziphius differently. As it had a hooked beak and blazing eyes, he believed that it must have been a distortion of the giant squid or kraken. Magnus, O. (1555) Historia de gentibus septentrionalibus. Giovanni M. Viotto, Rome. Magnus, O. (1561) Histoire des pays septentrionaus. Christophle Plantin, Antwerp. de Montfort, P. D. (1801) Histoire Naturelle, Générale et Particuliere des Mollusques, Tome Second. F. Dufart, Paris. Unknown. (1538) Ortus Sanitatis. Joannes de Cereto de Tridino.